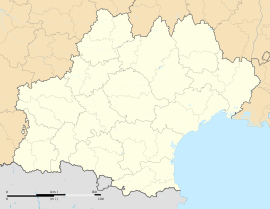 Muret (French pronunciation: ​[my.ʁɛ]; in Gascon Occitan Murèth) is a commune in the Haute-Garonne department, of which it is a subprefecture, in the Occitanie region of southwestern France. Its inhabitants are called Muretains. It is an outer suburb of the city of Toulouse, even though it does not belong to Toulouse Métropole, which it has declined to join. It lies southwest of Toulouse and is the largest component of the intercommunality of Muretain. Muret is generally known for the Battle of Muret (1213) and as the birthplace of Clément Ader (1841-1925), inventor and aviation pioneer. It is also the birthplace of the Niel family [fr] from which Adolphe Niel, Marshal of France and Minister of War, was derived. A floral town (two flowers) located in the urban area of Toulouse [fr] and the Toulouse urban unit [fr], 22 kilometres (14 mi) south of Toulouse. It is equidistant from the Mediterranean and the Atlantic, on the Garonne Toulouse plain [fr]. The commune is established on the first terrace of the Garonne [fr] on its left bank. Its right bank is overhung by a steep slope which deeply cut the molasse of the Tertiary era. It has an area of 5,784 hectares (14,290 acres) and an altitude ranging from 152 to 305 metres (499 to 1,001 ft). By road: By the Route Nationale 117 [fr] and the A64 autoroute (old Route Nationale 125 [fr]), exits 35 , 34 , 33 . By rail: By the SNCF, Gare de Muret TER Midi-Pyrénées on the Toulouse - Bayonne line (Line D of the Toulouse transit network [fr]). By bus: By the Arc-en-ciel de Haute-Garonne [fr] network, Toulouse transit network [fr] Tisséo and the TAMtam network. 58 bus route from Basso Cambo [fr] to the lycée Pierre-d'Aragon passing through the centre of the commune. 117 bus route from Potier-Oncopole [fr] to Muret railway station. By air: Muret is 26 kilometres (16 mi) from Toulouse–Blagnac Airport, as well as 5 kilometres (3.1 mi) from the Muret – Lherm Aerodrome (tourist flights) and the Toulouse Francazal Airport [fr] (business jets). Muret is located on the Garonne river at its confluence with the Louge, which flows northeast through the commune. The Garonne flows north through the commune and forms part of its northern border. The Ousseau [fr] tributary of the Touch is also in the commune, and the Canal de Saint-Martory [fr]. Muret has an oceanic temperate climate, with Mediterranean and continental influences, characterised by a hot, dry summer, mild winter and a spring marked by heavy rains and severe thunderstorms. The prevailing winds are, in order of importance, the west wind (usually bringing moisture from the Atlantic Ocean), the southeast wind (also called the Vent d'autan [fr], a rather hot, dry wind) and the north, which is much less frequent and generally a cold and dry wind (bringing air from cold anticyclonic masses in Northern Europe). Muret has averaged 24 days of extreme heat and 33 days of frost per year. The rainiest months are April, May and June. The normal minimum temperatures occur in January with average 5 °C (41 °F), and the maximum normal temperatures in August with 23 °C (73 °F). Various discoveries by local archaeologists has led to the thinking that the territory of Muret was populated as early as the Neolithic period: A hut foundation dating from 4000 BC has been unearthed to the north of the town. Different objects in the Chalcolithic, around 3,000 to 2,500 BC; then the Bronze Age from 1,700 BC indicate the permanence of the population here. A series of Gallo-Roman brick kilns dating back to the 1st century AD is located along the right bank of the Garonne. A villa occupied the site of the current town centre; surrounded by protective walls it was given the name of Murellum, which became Murel, and then Muret in the Middle Ages. On 12 September 1213 the Battle of Muret took place between Simon de Montfort and a coalition force under the control of Count Raymond of Toulouse, and King Peter II of Aragon. Muret entered history. That day, the battle changed the horizons of both sides of the Pyrenean border and saw the fate of Occitania decided. In an era where feudal entities (including the Count of Toulouse and his allies) still believed that they were able to play a role in the control of the southern areas on both slopes of the Pyrenees, the lords of the north of France, who spearheaded the Albigensian Crusade, attempted to impose themselves upon the south and eliminate Catharism. De Montfort had been fighting Albigensian heretics during the Albigensian Crusade, when he was besieged by the vastly superior coalition army. Refusing to surrender or be starved into submission, de Montfort went on the offensive. Leading his knights out of the town, he proceeded to position them in a wide arc, then fell upon the Toulouse cavalry with a noise like a whole forest going down under the axe. Next to fall before the Crusader army was the Aragonian cavalry, where King Peter himself fell to the sword. After this, all that was left was to scatter the remaining cavalry defending the coalition camp before turning on the infantry that had been besieging Muret's walls. Despite their overwhelming advantage in numbers,the coalition army numbering almost 34,000 men was destroyed by de Montfort's army of only 2,100. The siege of Muret was lifted. 7,000-20,000 coalition troops were killed compared to a handful of casualties for de Monfort's army. So it was at Muret, on 12 September 1213, where King Peter II of Aragon who came to reinforce the local Occitan forces, lost his life. This defeat of the Occitano-Aragonese troops heralded the annexation of the Languedoc to the Crown of France and the end of Catharism. "Quartered: On the first and fourth of argent to two crenellated fesses azure, the second and third gules to the four otelles of argent backed and posed in saltire", which is of Comminges. The commune is part of the Sixth district of the Haute-Garonne [fr]. The capable courts for the commune of Muret are the Court of Muret, the High Court [fr] of Toulouse, the Court of Appeal, the Cour d'appel de Toulouse [fr], Toulouse juvenile court, the Industrial Tribunal of Toulouse, the Commercial Court [fr] of Toulouse, the Administrative Court [fr] of Toulouse and the Administrative Court of Appeal [fr] of Bordeaux. Muret is a true centrality in the area of life and activity of the Muretain, near Toulouse. Its stable economic fabric is composed primarily of small and medium-sized enterprises and industries, covering many sectors of activities. The economic development jurisdiction is exercised by the Agglomération Community of Muretain, which develops and consolidates the local economic fabric, and helps the creation of enterprises for the benefit of employment. Muret has important reserves mainly located on the areas of activities of the territory. Muret Gateway: 20 hectares (49 acres) located north of the town, at the junction of the A64 exit. Cap Clément Ader / Les Bonnets: Adjacent to the Muret-Lherm airport, with in its centre, the international karting. Joffrery: 97 hectares (240 acres) at the northern entrance of Muret. Marclan: 35 hectares (86 acres) north of the town. Sans Soucis: 16 hectares (40 acres) at the northern boundary of the town. Muret detention centre [fr], specialised in long sentences. Bertrand Cantat, was held in this centre from 28 September 2004 to 15 October 2007 for the killing of his girlfriend, the actress Marie Trintignant. Peter II of Aragon, (1177?-1213), King of the Crown of Aragon-Catalonia, died at the Battle of Muret. A high school in the town bears his name. Léopold Niel [fr] (1846-1918), son of the Marshal, general of brigade (1897), was buried at Muret as his parents and his cousins, the Niels of Brioudes. Nicolas Dalayrac (1753-1809), composer of comic operas. Charles de Rémusat (1797-1875), politician and philosopher, deputy of Muret. Saint Germerius, Bishop of Toulouse [fr] (circa 691 AD). Christian Jeanpierre [fr] (1965-), sports presenter on TF1, presenter of Téléfoot. Louis-Noël Belaubre, pianist and composer (1932). Jean Laviguerie [fr] (1746-1802), Member of the Estates General. The Church of Santiago de Muret, main monument of the town: It was built in the 12th century through the Counts of Comminges who made wall their principal residence. It is redesigned and enlarged in the 14th and 15th centuries. Particularly noteworthy is its octagonal steeple of Toulouse type. It is classified as early as 1928. In 1538 - 1548, a large vaulted choir was added at the end of the panelled Gothic nave. Its decor is restored after the depredations of the Revolution, under the first Empire, in a neo-classical style and side chapels were built. The Château de Rudelle is a 16th and 17th century castle. Privately owned, it is inscribed on the list of historic monuments, listed as an historic site by the French Ministry of Culture. The list of historic monuments of Haute-Garonne [fr], organised by commune. Muret has a subprefecture, departmental fire and rescue service [fr], a gendarmerie, a post office, tax office, a retirement home, a DDE [fr] centre assigned to the A64 autoroute and a tourist office. The commune has a hospital (geriatrics, disabled), a versatile clinic with (MRI and medical radiology), a communal social action centre [fr], a retirement home, a day hospital, laboratories for medical analyses, ambulance services, nurses, midwives, general practitioners, rehabilitation professionals, pedicurists-podiatrists and dentists. Education is provided at the commune of Muret's creche, passing through nursery school [fr], elementary school [fr] and collège until the lycée [high school]] and technical school [fr] all being complemented by the municipal library and outdoor centre. The city is also home to a branch of the National School of civil aviation. Muret offers more than 100 sport and leisure events per year. Its facilities are many and varied: Gymnasiums, tennis courts, recreation area with a fitness trail, two landscaped lakes, international karting, an aerodrome, a canoeing facility, three bowling facilities, a skate park, two shooting ranges, a velodrome, a riding club and the Aqualudia, the Muretain swimming centre with its six indoor and outdoor pools. Avenir Muretain XV, Rugby union club which plays in Fédérale 3. AS Muret [fr], football club which played in the Championnat National (3rd division) and the AS Muret women's team. Texman, bridge club with 120 members. The 2014 Fencing Championships of France [fr] took place at Muret. The Scorpions de Muret [fr] American football team. Muret will also host the departure for Stage 13 of cycling's 2015 Tour de France on 17 July, with a 198.5 kilometres (123.3 mi) route to Rodez. The town is part of the pastoral sector of Muret, which includes the parishes of Saint-Jacques, Saint-Jean, and the parishes of the villages: Estantens, Ox [fr], Le Fauga, Eaunes and Saint-Hilaire. Father Joseph Coltro is the senior priest of this pastoral area. The cultural association of the Evangelical Church in Muret occupies premises located at 12 Chemin de la Pyramide, inaugurated in November 2012 after a year of work. The pastor is Bernard Gisquet. The Association of Franco-Muslim culture and worship of Muret (AFMCCM) acquired the premises of a former locksmith, Rue Marclan, in an industrial area north of Muret, in 2000, for the founding of the mosque of Muret. Collection and treatment of household waste and assimilated waste as well as protection and the development of the environment are part of the agglomeration community of the Muretain [fr]. There is a recycling centre in the commune. ^ "CAPITOUL, Météorologie de Toulouse". Météo France. ^ "Liste des juridictions compétentes pour une commune". le site du ministère de la Justice et des libertés. ^ "Muret" [Muret] (in French). Retrieved 15 May 2015. ^ "31395-Muret 2006" [31395-Muret 2006] (in French). Retrieved 15 May 2015. , "31395-Muret 2011" [31395-Muret 2011] (in French). Retrieved 15 May 2015. and "31395-Muret 2012" [31395-Muret 2012] (in French). Retrieved 15 May 2015. ^ a b c "Chronologie de l'affaire Bertrand Cantat". Nouvel Observateur. Archived from the original on 2009-10-02. ^ "Monuments historiques". www.culture.gouv.fr. Retrieved 17 March 2008. ^ "Patrimoine et architecture - Chiffres clés 2010" (PDF). Ministère de la Culture et de la Communication. ^ "Centre Hospitalier de Muret". ^ "L'école municipale d'enseignement artistique Nicolas-Daylarac". ^ "plus de 50 associations sportives". ^ "Secteur pastoral de Muret sur le site officiel du diocèse de Toulouse". Archived from the original on 2010-12-18. ^ "Site officiel de l'association". ^ "Muret. «Happy day» au temple protestant". ^ "Muret. Un temple de culte chemin de la Pyramide". ^ "La mosquée de Muret, de la serrurerie à la maison de Dieu". Wikimedia Commons has media related to Muret. This page was last edited on 4 April 2019, at 17:57 (UTC).